At dawn on the first day of the week, Mary Magdalene and the other Mary went to look at the tomb. And an angel of the Lord came down from heaven and rolled back the stone. His appearance was like lightening, and his clothes were white as snow. The angel said to the woman, “Do not be afraid, for I know that you are looking for Jesus, who was crucified. He is not here; he is risen, just as he said. Go quickly and tell his disciples: ‘He has risen from the dead and is going ahead of you into Galilee. There you will see him.’” The eleven disciples went to Galilee where Jesus had told them to go. Then Jesus came to them and said. “All authority in heaven and on earth has been given to me. Therefore, go and make disciples of all nations, baptizing them in the name of the Father and of the Son and of the Holy Spirit, and teaching them to obey everything I have commanded you. And surely I am with you always, to the very end of the age.” After the Lord Jesus had spoken to them, he was taken up into heaven and he sat at the right hand of God. 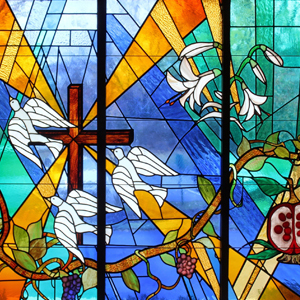 This window is a symbolic depiction of Christ’s resurrection and ascension. The cross represents Jesus’ crucifixion, the lilies symbolize his resurrection; the pomegranate, its seeds bursting forth, represents future life; and the three doves in heavenward flight symbolize t he Holy Trinity – Father, Son and Holy Spirit.